PDF is a popular document format, which is usually preferred for reports, whitepapers, and even legal documents. This is because PDF is considered as a “read-only” format that cannot be altered without leaving behind an electronic footprint. But we often come across situations where we need to modify the contents of a PDF file (usually reports), add an image here or there, annotate on that trend chart, or just edit a paragraph to include additional details. Most PDF Readers support basic annotation features, while a few basic PDF editors allow you to edit text and images into PDF documents. Although, depending on the situation, such edits might not always be convenient, as the newly inserted text appears as a separate layer, and not in line with the original text. The best you could do is to clear out the existing text (assuming the background is white), and type the whole thing over, including your edits, and ensure that the font matches with the existing one. Another way to edit PDF documents is to convert the file in an editable format (such as MS Word or Apple Pages), and then make the required changes. But, converting the document is not usually recommended, as sometimes it changes the original formatting. Page size, alignment, fonts and other attributes may be altered when a PDF document is converted. Also, a lot of PDF documents we come across contain scanned pages instead of actual text. In such cases, editing the PDF is more challenging, as the content you are trying to edit is in fact an image. Of course, there are some premium solutions available in the industry that help you to overcome these challenges, and help create, edit and annotate PDF, providing high quality, desirable outputs. These solutions usually cost a lot of money and also come in subscription-based models, which may not be suitable for all. Today, we’ll explore an affordable but powerful PDF editor that provides high quality, professional tools for creating, editing and converting PDF documents easily. The editor, iSkysoft PDF Editor 6 Professional, is available for both Mac and Windows, and also supports OCR for images in PDF, annotations, password protection, and more. 1.4 Convert PDF to Word, Excel, etc. iSkysoft PDF Editor Professional allows you to create and professional quality PDF documents with various elements (texts, images or backgrounds) properly aligned, so that they don’t look out of place. While editing documents, the software automatically detects the various elements present in the PDF and lets you edit them along the same layer. It automatically inherits the font style of text elements so that you don’t have to spend time figuring out which style has been originally used. You can also add, delete, extract, replace or crop images and text in PDF files with a few clicks. Not just that, PDF Editor Professional lets you to seamlessly add, delete or re-organize pages in a PDF document. You can split a single PDF into multiple files, or even merge multiple PDF files into one. Other supported editing options include custom backgrounds, header & footer, custom page orientation, etc. There’s no provision yet to open a blank PDF document and start entering text, images and other elements, as you’d normally expect in a word processing software. But then again, Microsoft Word, Apple Pages and other word processors allow you to export their documents as PDF. Additionally, you can directly create PDF documents from images, HTML, and other text formats, using iSkysoft PDF Editor Professional. iSkysoft PDF Editor Professional offers a number of markup and annotation tools to make document editing more interactive. Added annotations can easily be hidden or shown with the help of a button. Annotation elements like sticky notes, callouts, comments, etc., allow users to express their thoughts and opinions about document changes. You can even highlight, underline or strikethrough portions of texts PDF files. Convert PDF to Word, Excel, etc. iSkysoft PDF Editor Professional is a powerful document conversion tool that allows you to create PDF files from web pages, images, EPUB and text files. Alternatively, you can also convert an existing PDF document to several other formats, such as Word, PowerPoint, Excel, HTML, EPUB, Rich Text, Plain Text, and images. Any editing or markup performed before conversion, is automatically carried forward in the output. You can even convert password protected PDF files to other document formats (Password is required to unlock the file first). iSkysoft PDF Editor Professional is integrated with a powerful, multi-lingual Optical Character Recognition (OCR) module, which is separately available for download. The module helps to create rich, editable PDFs from scanned documents, which are primarily composed of images. The results of OCR are quite impressive, as it is almost able to accurately extract text information from scanned images, without altering the document’s original form, layout, style, etc. 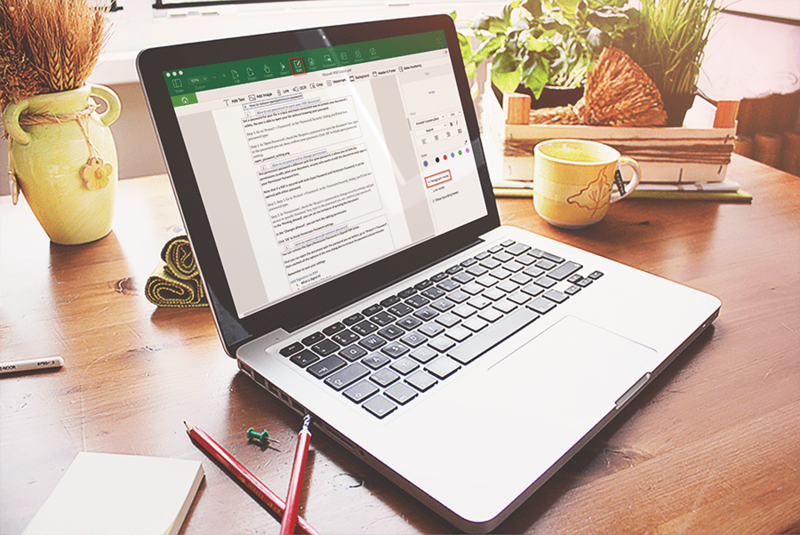 The OCR module intelligently processes scanned documents to identify and segregate background, text and image elements, so that you can save, edit and annotate the processed document, just as any other editable PDF. Along with filling interactive and non-interactive forms, PDF Editor Professional provides the option to highlight, edit and clear form fields within PDF documents. You can also create interactive forms, containing text fields, buttons and other form elements, and even configure their properties and behavior. It has a collection of free PDF form templates which can be downloaded and customized as required. iSkysoft PDF Editor Professional includes several security features, such as addition of passwords, digital signatures, etc., in PDF documents. Redaction of sensitive content (text and images) from PDF documents, are also supported. When finally done editing a PDF, iSkysoft PDF Editor Professional provides three simple and quick ways to share the content with others — Print the PDF from within the program using customized print options, Attach it to email and share, or upload the file to Dropbox. If your PDF file is too large, you can also compress it to smaller size without losing quality (lossless compression), using a built-in tool. You can also preview the result before compressing. iSkysoft PDF Editor Professional includes a batch operation tool, should you wish to perform the same action on multiple PDF documents. Conversion, Data Extraction, OCR, Bates Numbering, Adding/Removing Watermark, Adding/Removing Encryption, are all supported for batch processing of PDF documents. Overall, iSkysoft PDF Editor 6 Professional is a powerful all-in-one PDF editing tool that offers a wide variety of useful features. If there’s any major feature that’s missing here, it’s the inclusion of built-in collaboration features, which is available with some of the competitors. But, considering the low price and single-time payment that iSkysoft offers, the small trade-off is not much of a deal breaker, especially if you’re looking for a single user license. The software is available as a free trial for 14 days. The free trial contains certain usage limitations, such as addition of a watermark on all pages of output PDFs, unavailability of OCR feature, limited pages for conversion, and a few others. To unlock these limitations, you need to purchase the product, which costs $99.95 for a single user lifetime license. Though it may seem like quite high a price, it’s probably the lowest when you compare it with other top-tier PDF Editors available in the industry. iSkysoft PDF Editor Professional justifies its price for the features that it provides, the same features that make the product an essential tool for PDF users. Get iSkysoft PDF Editor 6 now.